Location of Greenville in Butler County, Alabama. Greenville is a city in Butler County, Alabama, United States. At the 2010 census, the population was 8,135. The city is the county seat of Butler County and is known as the Camellia City. The movement to change the official Alabama state flower from the goldenrod to the camellia originated in Greenville with legislative sponsors LaMont Glass and H.B. Taylor. Greenville was first settled in 1819. Its original name was Buttsville, but after becoming the county seat in 1822, its name was changed to Greenville, in remembrance of the former locale in South Carolina of many of the original settlers. The first county seat was at Fort Dale, a fortification that was named for Sam Dale, who fought to defend the area during the Creek War. The site of Fort Dale lies on the north of the city near the Fort Dale Cemetery, along what is now Alabama Highway 185. During World War II, a satellite camp for German prisoners was based in Greenville. Greenville is located in southern Alabama at 31°49'52.583" North, 86°37'39.241" West (31.831273, -86.627567). Interstate 65 passes to the west of the city center, with access from exits 128 and 130. U.S. Route 31 passes to the east of the city center. Montgomery, the state capital, is 44 miles (71 km) north, the closest city to Greenville with a population above 50,000. Mobile is 127 miles (204 km) to the southwest on I-65. According to the U.S. Census Bureau, Greenville has a total area of 21.5 square miles (55.8 km2), of which 21.4 square miles (55.3 km2) is land and 0.19 square miles (0.5 km2), or 0.82%, is water. The city of Greenville has a humid subtropical climate, with an average high temperature of 77.3 °F (25.2 °C) and an average low temperature of 53.8 °F (12.1 °C). The city averages 4.80 inches (122 mm) of precipitation per month. As of the census of 2010, there were 8,135 people, 3,332 households, and 2,126 families residing in the city. The racial makeup of the city was 55.5% Black or African American, 41.7% White, 0.0% Native American, 1.8% Asian, 0.5% from other races, and 0.5% from two or more races. 1.3% of the population were Hispanic or Latino of any race. In the city, 27.3% of the population was under the age of 18, 8.6% were 18 to 24, 25.0% were 25 to 44, 24.4% were 45 to 64, and 14.8% were 65 years of age or older. The median age was 35.3. For every 100 females, there were 82.2 males. For every 100 females age 18 and over, there were 78.7 males. There were 3,332 households. Of those, 31.6% had children under the age of 18 living with them, 35.0% were married couples living together, 25.3% had a female householder with no husband present, and 36.2% were non-families. 33.3% of all households were made up of individuals, and 13.1% had someone living alone who was 65 years of age or older. The average household size was 2.40 and the average family size was 3.06. The median income for a household in the city was $26,664, and the median income for a family was $31,107. Males had a median income of $33,716 versus $24,928 for females. The per capita income for the city was $15,649. About 20.3% of families and 24.9% of the population were below the poverty line, including 30.1% of those under age 18 and 20.9% of those age 65 or over. Public education is provided by the Butler County Board of Education. Private schools in Greenville include Fort Dale Academy and Camellia City Christian School. Lurleen B. Wallace Community College, member of the Alabama Community College System awards two-year associate degrees and professional certificates. Prior to the Civil War, cotton farming was the main occupation in Butler County. During the 1850s lines along the Mobile and Ohio Railroad were constructed, making the county a major trading center. Greenville was a railroad town and became the center of commerce between Montgomery and south Alabama. During the late nineteenth century, the construction of the Louisville and Nashville Railroad through Greenville contributed further to the town's success. At the turn of the century, Gulf Red Cedar Company and Factory in Greenville became a noted bucket manufacturing enterprise. Today, Greenville has a diverse industrial manufacturing base of companies in the textile, wood products, automobile, and other industries. Major employers include Hwashin American Corporation, Hysco America Corporation, CorStone Industry, and Connector Manufacturing. The local government of Greenville is run by the Mayor and City Council. The city council consists of five members each elected from single member districts. The city is located in Alabama's 2nd Congressional District and is currently represented by U.S. Representative Martha Roby. WGYV has applied to relocate its license to Aurora, Indiana. Greenville was a common setting in the 2002 movie Sweet Home Alabama. None of the movie was actually filmed in Greenville. The city's residents were featured on the premiere episode of the ABC reality/game show series My Kind of Town, on Sunday, August 14, 2005. The 2007 movie Honeydripper was shot in locations around Greenville in late summer and fall of 2006. The film featured sites located on Main Street in the city's historic downtown. Local residents were selected as principal characters and extras for the movie. New Beginnings Ministry's church choir was featured in the film. Located in Greenville is the historic Ritz Theatre, a local theatre where community events and plays can be performed for the city. Annually, the city's Area Arts Council will perform a musical revue by the name of "Puttin' on the Ritz" which has a different theme each year. Greenville is the location of a Robert Trent Jones-designed golf course, Cambrian Ridge, 7 miles (11 km) northwest of downtown, and to Sherling Lake Park and Campground which has 41 campsites and surrounds two lakes just east of the golf course. ^ a b "Geographic Identifiers: 2010 Demographic Profile Data (G001): Greenville city, Alabama". U.S. Census Bureau, American Factfinder. Retrieved September 18, 2013. ^ "Camellia Day". The Office of Alabama Governor Robert Bentley. Retrieved 15 January 2016. 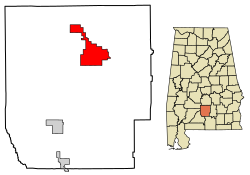 ^ "Alabama Counties: Butler County". Alabama Department of Archives and History. Retrieved 7 January 2010. ^ "History". City of Greenville, Alabama. Retrieved 7 January 2010. ^ Gannett, Henry (1905). The Origin of Certain Place Names in the United States. Govt. Print. Off. p. 144. ^ Hutchinson, Daniel (October 6, 2009). "World War II POW Camps in Alabama". Encyclopedia of Alabama. Retrieved 7 January 2010. ^ "About LBWCC". Lurleen B. Wallace Community College. Retrieved 8 January 2010. ^ "Butler County". Encyclopedia of Alabama. December 10, 2009. Retrieved 7 January 2010. ^ "Application Search Details (BMJP-20051031AGM)". FCC Media Bureau. August 6, 2008. This page was last edited on 6 April 2019, at 02:25 (UTC).